Punjabis have long dominated Bollywood what with scores of Kapoors, Chopras, Anands, Deols, Mehras, Sagars, Sahnis, Roshans and many more having a firm hold on Mumbaia films for long years. However, there were just a film or two in many decades that carried a flavour of Punjabi life and culture. Of course, some themes were perennial favourites like the love legends of Heer-Ranjha or Sohni-Mahiwal and the inspiring saga of patriot Bhagat Singh were made over and again. Apart from these, there was very little else to give a feel of the land that these scores of filmwalas came from. Now, there is an upsurge of the Punjabi family drama and other themes close to the soil. 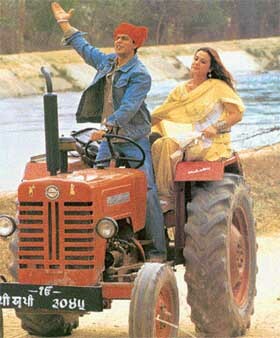 Veer Zaara is the latest to capture the soul and spirit of Punjab on both sides of the border. Not just Mumbai cinema, the Punjabi family drama courtesy Gurinder Chadda has become a sought-after theme even in British cinema. And the lady has been honoured for setting this trend in the British House of Commons. Well she has made a heady cocktail of Austen and Amritsar and it is balle balle all the way. If one delves into the past then very few films reflected the Punjabi way of life. One old black-and-white movie that did give a feel of life in the Punjabi-speaking hilly areas of Punjab, before the 1966 reorganisation of states when the Kangra valley went to Himachal, was Bambai ka Babu. It was a Dev Anand thriller that began in a smoky gambling den in Mumbai and moved to a hilly village in the north. The film had some memorable musical numbers like Chal ri sajani ab kya soche and Diwana mastana hua dil set to the magical music of S.D. Burman. Later, B.R. Chopra’s Waqt of the Sixties took up the story of a Punjabi trader, Lala Kedar Nath. But for the initial few scenes capturing the lost lifestyle of Quetta in the North West Frontier Province, the film soon moved to the very cosmopolitan Delhi and Mumbai, exploring the usual lost-and-found formula that Hindi cinema delights in. One always wondered why no Punjabi had gone out to make a film reflecting the land and its people they way they were. I remember putting this question to many and always getting evasive replies. I recall Dev Anand telling me, "You see we belong not just to Punjab, we belong to the whole country." Gulzar, the Bimal Roy assistant so smitten by Bengali culture, said, "I can read Bangla and not Punjabi so my films are more often based on Bangla stories." Of course, he went on to make Maachis many years later but that even with Chappa chappa charkha chale was more a film on the theme of terrorism and Punjab was incidental. Good old Dara Singh gave an interesting reply to this query in the course of an interview many years ago. He said, "You see Hindi films are not based on reality. These are fantasies catering to many areas so they must have a bit of Rajasthan and a bit of Kashmir and so on." However, the reason for this is the inferiority complex that Punjabis suffer from when faced with lingual areas that have more developed traditions of art and literature. Probably, this kept them away kept them away from touching the homegrown. The tide changed in the mid-1990s when Shah Rukh Khan and Kajol danced their way into the hearts of the audiences in Dilwale Dulhaniya Le Jayeinge(DDLJ). This blockbuster released in 1995 has made history by showing for eight long years in the same cinema hall in Mumbai. With Kajol playing Simran, the story moves from London to a Punjabi village haveli with hordes of relatives. The success of this film inspired similar back home in the big house in the village experiments like Dhai Akshar Prem Ke but that film did not do well. However, the big house of the landlord, the nearly extinct tribe of salwar-kameez-clad Beejis (grannies) and turbaned kith and kin have come to stay in the films. The multi-starrer Kabhie Khushi Kabhi Gham (K3G) had both naani and daadi of the theth Punjabi variety portrayed by Achla Sachdev and Sushma Seth. In fact earlier, but for the historical and religious films, Sikhs were often crudely caricatured. The Shammi Kapoor and Sharmila Tagore starring film An Evening in Paris had a caricatured portrayal of a Sikh done by Rajendra Nath. Following protests, certain scenes had to be taken off the film. After the grand success of DDLJ, it was British filmmaker of Indian origin who portrayed the Punjabi family drama with aplomb in Bend It Like Beckham. This NRI family story gave us a very endearing portrayal of the turbaned father by Anupam Kher. More recently, it was a re-mix of very Victorian Jane Austin with Amritsar in Bride and Prejudice. The essential ingredients for the Punjabi family drama are kinship, love, and hurdles. Of course, all this has to be punctuated liberally with the steps of the Bhangra with the forefingers raised up to a Balle Balle! Chadda also portrays the mood of the Indian origin girl who makes it in life. She does so by catching the White man for lover or groom. At one time that was the achievement factor for the men in life but on screen they would give up the bad Western woman for the good desi bride. Could the phenomenon of Punjabi pop have contributed in re-shaping the destiny of the Punjabis on screen and having the whole film revolve around them? Perhaps not so. For Hindi films made liberal use of Bhangra and the tappa, but that would just begin and end with the picturisation of the song. In the 1950s, Vyjyanthimala and Dilip Kumar sang Udhein jab jab zulfein teri the Punjabi way clad in tehmats but switched to central Indian attire soon after. Similarly, Raj Kapoor had the famous song with Manohar Deepak doing bhangra in Jagate Raho but that was all that was of Punjab there. Subsequently, many films had songs inspired by Punjabi folk. The song over and Punjab is forgotten. More recently, Punjab returned in full force in Partition films like Ghadar and Pinjar, the latter based on a novel by Amrita Pritam. Before Pinjar too a number of films were based on literature of the soil. These include Pavitar Paapi, based on Nanak Singh’s novel, Uski Roti, inspired by a short story of Mohan Rakesh and Ek Chaddar Maili Si, based on a classic novella by Rajinder Singh Bedi. In fact Bedi, a talented filmmaker had wanted to make this film himself, way back in the Sixties with Geeta Bali and Dharmendra in the lead. But the project was shelved with Geeta’s sudden death. Two decades later Sukhwant Dhada made the film with Hema Malini and Rishi Kapoor. The film fell short of promise. Interestingly, even when the scenario has been Punjabi very rarely has a Punjabi actress played the lead. The old film Bambai ka Babu had Bengal’s Suchitra Sen in the lead, Maharashtrian Tanuja in Pavitar Paapi, Tabu of Hyderabadi fame in Maachis, and Rano of Bedi’s classic was the dream girl from down South. Even Chadda picked the Manglorian Aishwareya for Bride and Prejudice and dulhaniya of DDLJ was Kajol. This even when there are more Punjabi lasses around than in the old times. Not just the big screen, even the small screen is relishing in putting together the Punjabi act. While Des Mein Nikla Hoga Chand is a desi saga between London and Chandigarh, death and rebirth with the current heroine actually named Heer, even Saas bhi`85 sent Tulsi on an amnesia trip to be found in a silken salwar-kameez, jutti and parandas in Chandigarh. Not just that, the Gujju ladies in this serial have even learnt to do Karva Chauth the Punjabi way. Our beebi rani Jassi has set unparalleled records and our lovely Juhi is so enchanting uttering the ever so familiar ‘Mummyji’ just as we do it back home in Sector 23, Chandigarh. The distinct flavour of the culture or as some would say agri(culture) is catching up. The trend is welcome even if the credit for it must go to the dollars and pounds earned in Toronto or Birmingham. Well no apologies please, we are as Punjabi as can be.